Turner’s most ambitious and influential printmaking enterprise was the Liber Studiorum (Book of Studies). The series comprises 71 plates. It was issued in 14 instalments at irregular intervals between 1807 and 1819. Each instalment contained five prints, except for part ten, which also included the frontispiece. The series was undertaken in direct rivalry with the Liber Veritatis of Claude Lorrain, the great 17th-century landscape painter whose subjects and compositions are echoed in many of Turner’s works. But more than a compendium simply reproducing existing pictures, Turner conceived his project with an unmistakably didactic purpose in mind. The Liber was a vehicle for Turner to communicate his ideas about the dignity of the landscape genre – and his versatility within it. Each print in the published edition is marked with an initial according to a classification system devised by the artist representing the different categories of landscape: H for historical; Ms or M for mountainous; P for pastoral; M for marine; A for architectural; EP for elevated pastoral (ie Claudian). For almost all of the plates, Turner etched the outlines of the composition himself (see accession number 2000.47). They were then completed in the tonal medium of mezzotint by professional engravers, working closely from Turner’s monochrome wash drawings. The first 20 plates of the Liber were mezzotinted by Charles Turner (no relation) but the collaboration between the two Turners ended with a quarrel over payment, and new engravers had to be brought in. A number of plates were completed entirely by Turner, who taught himself to mezzotint over the course of the project. The print depicts the Devil’s Bridge, which spans the sheer cliffs and surging Reuss on the St Gotthard Pass in Switzerland. 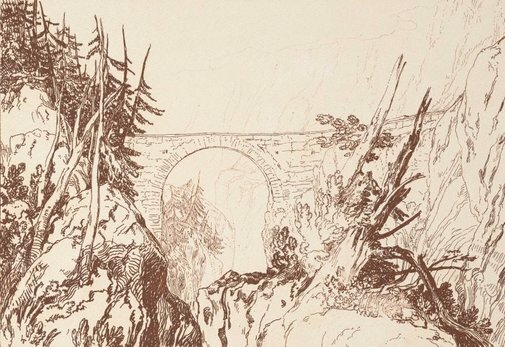 Turner had sketched the vertiginous bridge and other scenes of alpine sublimity during his first Swiss tour in 1802, and these sketches became the basis for subsequent works. According to AJ Finberg’s definitive 1924 catalogue raisonné of the Liber, the Gallery’s impression of Little Devil’s Bridge is an engraver’s proof, before the addition of the letter ‘M’ above the plate; it is otherwise lettered as the first published state, but with the spelling ‘Alldorft’ instead of ‘Altdorft’. The bare etchings never formed part of the Liber and only a few were printed. The etching of Little Devil's Bridge (2000.47) was among a cache of prints discovered among Turner’s studio effects when he died. These were finally sold by court order at Christie’s some 20 years later, following the protracted lawsuit over Turner’s will. All of the prints that passed through the sales in 1873–74 were embossed with the artist’s monogram (see Lugt 1498). As well as owning a complete set of Liber as issued by the publisher, the Gallery also preserves early proofs, alternative states and unpublished plates, which reflect the complex printing history of this project. All of the prints came from the collection of Arthur Acland Allen (1868–1939), who had assembled the most comprehensive collection of its kind. Prints & drawings Europe 1500-1900 , Sydney, 2014, coll illus p 115.